What is the ‘Reading Suggestions’ section? The ‘Reading Suggestions’ section is exactly what the name suggests: a collection of articles that you should read for improving your English Language Skills. With a curated set of articles, you get access to the best of the world of publishing in a single place. Each post in this section contains recommendations for 3 articles. We provide you One Level-1 set and One Level-2 set on a weekly basis. 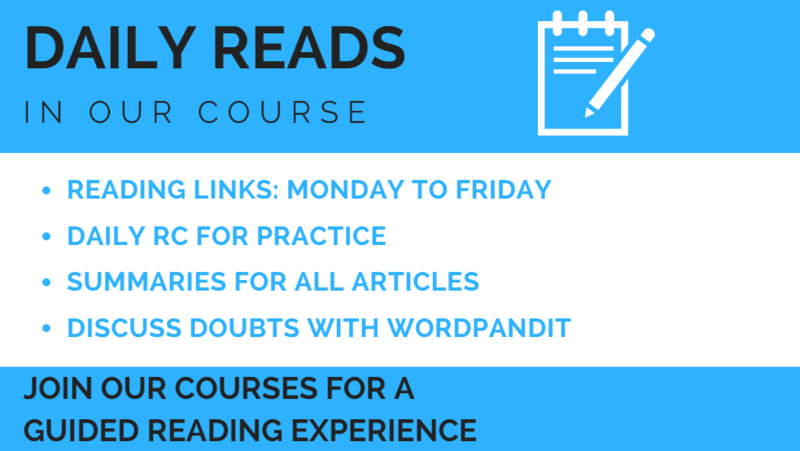 Daily Reads (level-2): CAT, GRE, GMAT, SAT, etc. You develop much-needed comprehension skills for life. Well, you can join our courses and receive a set of articles to read, discuss and analyse every day. You get a guided reading experience from Monday to Friday, each week. We provide you ONE RC every day. This RC is built using one of the reading links for the day. You can discuss your reading related doubts with Wordpandit himself daily on the Facebook group. In short, it is the perfect guided reading experience.